What if an NBA player wanted to dress up as Santa Claus? I'm sure that players do it every year and appear at charity events as the big red round winter machine. Those are players like Shaq or Dwight Howard who appear, steal the show and give the kiddies big ol' smiles and make X-mas a bundle of joy. Well what if someone like Ron Artest showed up? Here is the list of players guaranteed to make the worst Santa...ever. Stephon Marbury - Santa wouldn't sleep with his cousin's sloppy seconds. Chris Anderson - If smoking "meth" isn't an automatic disqualification from being Santa, then I'm never having kids. Ben Wallace - The goal of Santa is to NOT scare the hell out of the children. Allen Iverson - Most Santa's have at some point been in front of the mirror, you know, practicing? Sebastian Telfair - Hats also make great handgun storage devices? Robert Swift - Just look at the guy. Kevin Garnett - Because this would make any young kid pee his pants. Darius Miles - Sure, I like strip clubs as much as the next guy, but you are supposed to have reindeer with you, not Porsche, Trixie, Chastity, Lexxxie and Karamel. Zach Randolph - See Darius Miles. 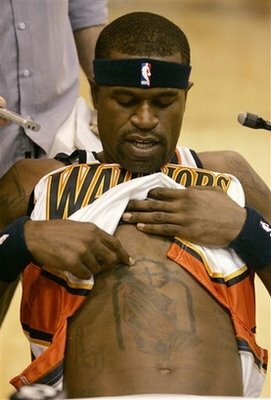 Stephen Jackson - Haymakers and gun tattoos? Ron Artest - Killing dogs and beating fans are one thing, but what about rap albums? Sasha Vujacic - Santa is supposed to be straight. Amare Stoudemire - This is the season of giving, so expressing your selfishness to the world just weeks before X-mas is not acceptable. Shelden Williams - A Santa hat will never fit on that gigantic forehead. Tim Duncan - Because whiners don't get presents, so why should they give them? Josh Howard - You can't street race Santa's sleigh while smoking a joint can you?